The MSA ALTAIR 5X Multi Gas Detector is capable of measuring up to 6 gases simultaneously and is now available with integrated PID sensor for VOC detection. 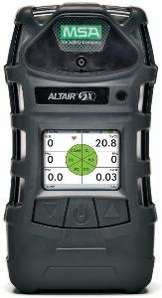 Driven by advanced MSA XCell� Sensor Technology, the ALTAIR 5X Gas Detector delivers faster response time, better stability, accuracy, longer service life, and cost savings over the life of the instrument. MSA 10116927 Altair 5X Multigas Monitor Industrial Kit features monochrome display, 10 ft sampling line, 1 ft probe and sensors to measures LEL, O2, CO, H2S and SO2.